That's right, 0.0001 AU with three zeros in front of the one. In terms of distance from the Earth to the Moon it's just 3% of the way. This asteroid has just been spotted and thus it's too bad that it will be missing the Earth, as its tiny size (1 ~ 2.3 m) means it would pose no danger whatsoever, and would instead give us a fine opportunity to learn more about how asteroids of this size break up in the atmosphere. 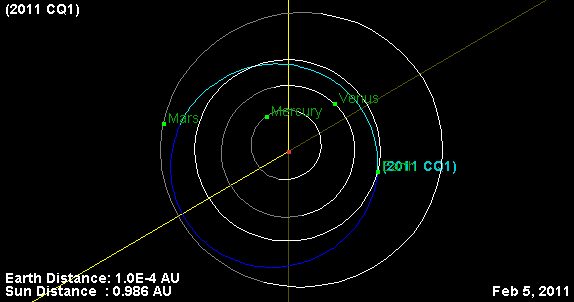 For comparison, the asteroid 2008 TC3 that broke up before it hit the ground that year was some 2 ~ 5 metres in diameter. Due to the very close approach we should end up with a few videos showing it as a tiny streak as it passes by. Relative velocity is pretty normal at almost 10 km per second. Edit: turns out the asteroid was 1.3 metres in diameter (a bit on the small side of the estimates) and passed by even closer than predicted, at just 5471 km. Not only is that just over 1% of the distance from Earth to the Moon, it's not even a sixth of the altitude of a geostationary satellite. Here's a plot of the asteroid over South America.